A second study found clear connections between declining snowpack in the West and increased wildfires in high-mountain forested areas dominated by trees such as ponderosa pine and Douglas fir. A third study, looking globally, concludes that declining snowpack could put the water supplies of more than one-sixth of the world’s population at risk. A fourth study found that the U.S. West’s snowpack seasons are being squeezed at both ends, with fall starting later and summer starting earlier. “Our winters are getting sick,” that study’s author, Amato Evan of the Scripps Institution of Oceanography in La Jolla, California, said at Wednesday’s annual American Geophysical Union conference in Washington, D.C.
“If you gauge the health of winter on how normal snows in the mountains look, it’s reasonable to come to (that) conclusion,” said Evan, an associate professor of atmospheric and climate science, in a telephone interview Friday. Evan and two other scientists who discussed their research at the conference, including UA professor of hydrology and atmospheric sciences Xubin Zeng, said they believe global warming and other forms of global climate change are at least partly responsible for the snowpack declines. “We know the reason why — it has to do with global warming. It’s rising temperatures. It’s the only logical explanation for what is happening,” said Evan, an associate professor of atmospheric and climate science. For one, he said, climate change is the most simple explanation for the declining snowpack, “and usually in questions like this the simplest answer is the correct one.” Second, there have been many climate model simulations forecasting snowpack declines over this century, and “more alarming, these are the changes we already see,” Evan said. Warming temperature is an important factor in the decline of snowmass, which represents the weight and depth of snowpack, Zeng added. That’s because it decreases the percentage of precipitation that falls as snowfall and increases snow sublimation, a process in which snow transforms into ice and then into water vapor without first melting, he said. • Zeng and two other researchers concluded that snowpack had declined 41 percent between 1982 and 2016 on 13 percent of the West’s total land area. The snow season was shortened by an average of 34 days over this period, on about 9 percent of the entire U.S.. Most of the declining area was concentrated in the West. The co-authors are Patrick Broxton, a UA associate research scientist in the School of Natural Resources and Environment, and Nicholas Dawson of the Idaho Power Company. The researchers studied snowpack levels in areas of the U.S. broken into individual squares measuring 6.25 square miles. 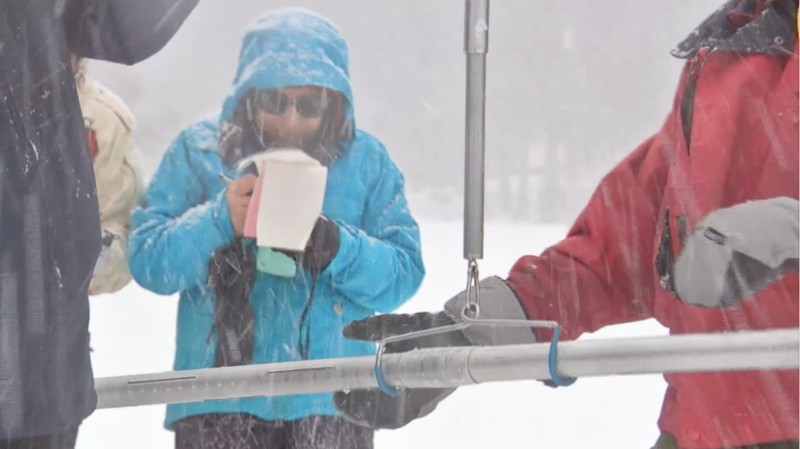 They looked at four kinds of snowpack data, including U.S. government-run monitoring stations. Their findings were just published in the journal Geophysical Research Letters. • Evan said based on his study, the weight of the snowpack, commonly called snowmass, has dropped up to 50 percent at monitoring stations around the West from 1982 to 2018. Generally, the snowpack seasons at high elevations are starting to resemble those at lower elevations, signaling declines at the more important high elevations, his study found. It was published in the Journal of Applied Meteorology and Climatology. Snowfall’s proportion of all annual precipitation is dropping more than 4 percent per decade in some key high mountain areas on the western Tibetan Plateau, middle-east Asia, northern Canada and on the Greenland Sea, he said. But it’s increasing about 2 percent every decade in oceans surrounding the Antarctic region.